Discussion in 'JS Plugin Releases (RMMV)' started by taaspider, Dec 8, 2018. The is free for commercial and non-commercial usage. Just please let me know so I can check it out! When we create a game, we usually create a whole new world rich in lore and details, and want to make it all available to the players, so that they can understand every single detail we develop. However, just dumping it all in lengthy dialogues usually bore and scare most of the players, who will simply give up on your world. A common alternative used by many AAA games is to minimize dialogue and exposition, and provide additional details through in-game books. This plugin aims to provide just that for your game: a book menu where the player can read up additional lore when he feels up to it. You can place books throughout your game, providing a bit more of context for hungry players as they progress, and keeping exposition to a minimum. Allows you to include inline images along with the book text. The image can be used with its original size, or proportionally resized through a special escape code. WARNING: This plugin requires RPG Maker MV 1.5.0 or above! 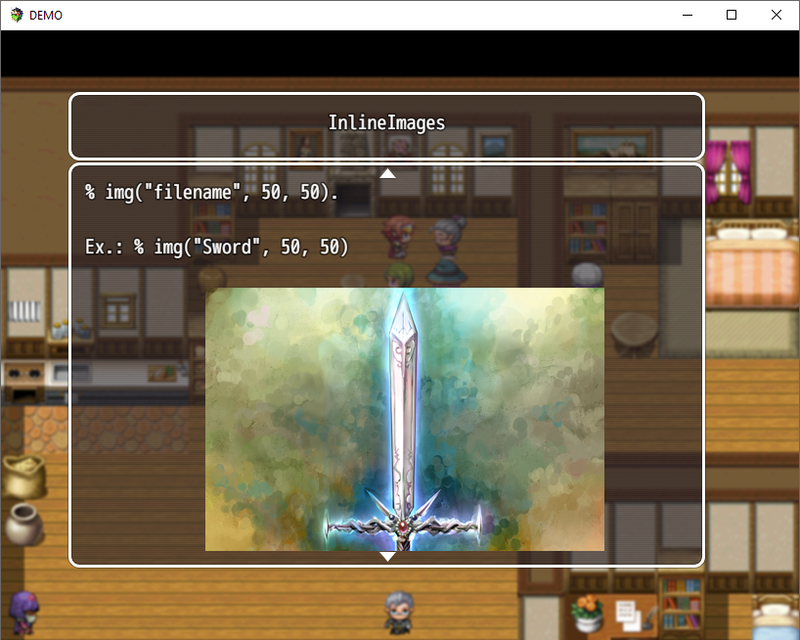 Please make sure your RPG Maker MV software is up to date before using this plugin. First of, download the plugin here. 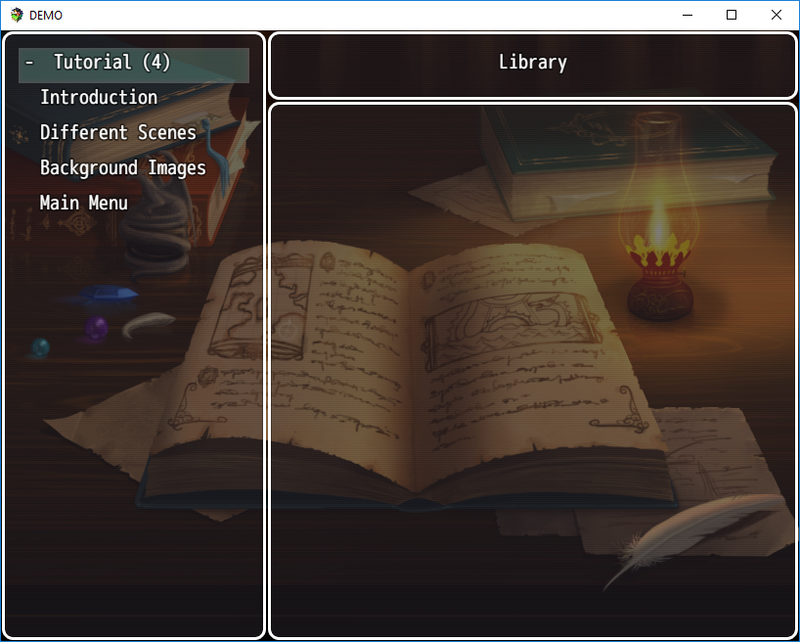 There's a bunch of parameters that allows you to customize each of the scenes (the detached book window and the book menu). The plugin's help section describe most which are not self explanatory, try taking a look there if you feel lost. One important thing though... you have to set up your books before you can call them inside your game. There's two ways of doing that: inside the Plugin Manager itself or using external JSON files. The plugin can only work with one of this methods at a time, so you need to chose which one you want at the "DataSource Type" parameter. I'll enclose the instructions for each case in spoiler tags below to make it more readable. The book category parameter must be one of the categories listed in the Category Order parameter. The Id is used only to order the books under each category. If you leave all Ids equal (0), the plugin will use the order it reads the books from the editor (usually the order you input them). If you want a book to have a custom background (overriding the global settings), just select an image for the "Custom Background" parameters. Leave it blank to go with the global background settings. This plugin has a default compatibility with localization plugins, like Iavra's Localization Core, for example). Plugins like this work with multiple external files, one for each language. If you want to use this feature, choose "Type" "Localization File" and point the plugin to one of the language files (any of them, it doesn't matter which), and configure "Localization Escape Code" accordingly, so that this plugin can build the placeholder tag for you. If you're not using a localization plugin and just want to load books from a JSON file, choose "Dedicated File" and ignore the "Localization Escape Code" parameter. The plugin gives a lot of options for you to setup background images on both scenes. Configurations are kept separate for each one, so you can set different backgrounds for each scene if you wish. All images must be in png format and located in the img/pictures folder. The parameters to config each type of background image is shared by all possible options. A warning though, the plugin won't manipulate, stretch or shrink images. It will only place the images as they are. It's up to you to provide images on the right size. There are also options to allow you to combine different configurations, so you can customize the background to your liking! The escape code %img("filename") can be used to include an image along with the book text in its original size (or resized to fit into window, see next section). The plugin will always look for images in PNG format in the pictures folder. You can also include optional parameters to force the plugin to resize the image to your liking: % img("filename", width, height) (again, no space between % and img). The code parameters width and height are percentile numbers. For instance, if you want the image to be displayed in half its original size use % img("filename", 50, 50). One additional note: images are loaded into memory asynchronously. Which means the plugin won't wait for it to be ready to show the book's text. If, however, the image finishes loading and the screen is already showing your book's text it will be automatically updated. In other words, slower machines may see the book load without the image, just to see the screen automatically update a few seconds later including it. - Triggers the book menu to be displayed. - Replace key with the book tag, if using a JSON file as datasource, or the book title if using Plugin Manager. If the key contains blank spaces between words, you need to remove them in the plugin command call. This will mark the book as read (if it isn't already) and display the detached book window with the book contents. - Use this commands to hide / show the book menu from the main menu list. - Use this commands to enable / disable the book menu at the main menu list. - Use this commands to make the player learn / forget books without opening the detached book window. Replace 'key' with the book tag, if using a JSON File as datasource, or the book title if using the Plugin Manager. If the key contains blank spaces between words, you need to remove them in the plugin command call. 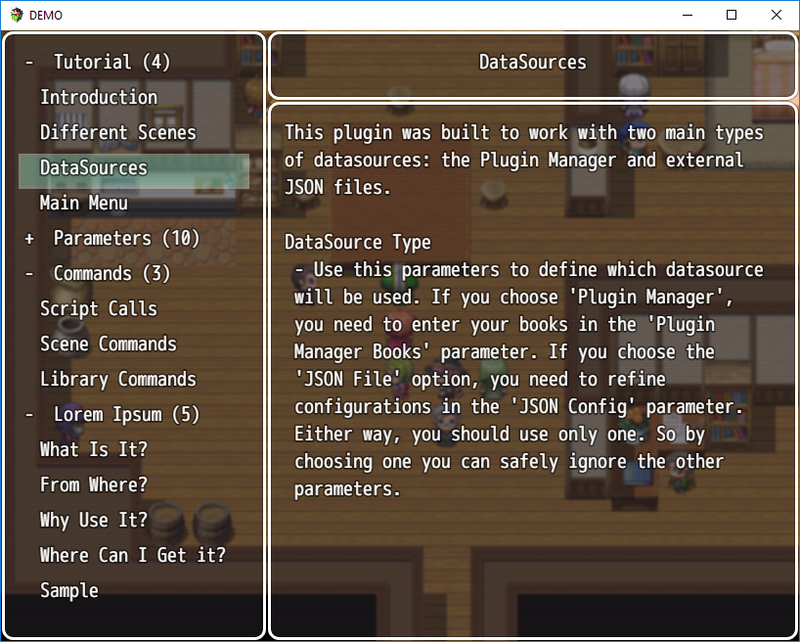 - Similar to the previous command, but this can be used to make the player learn / forget many books at once. - Use this to show / hide categories in the list window menu. - Use this to hide / show books not read by the player in the book list window. - Use this to hide / show the title bar on the detached book window. - Test if the book menu should be shown at the main menu. - Test if the book menu should be enabled at the main menu. - Test if the books categories are visible in the list window. - Check if books not found by the player are shown at the list menu. - Return the total number of books in the game. - Return the number of books the player has found. - Replace "category" with the category name, regardless of the datasource type selected. This will return the total number of books under this category. Remove blank spaces in the category name, if any. - Replace "category" with the category name, regardless of the datasource type selected. This will return the total number of books from the specified category that has already been read by the player. Remove blank spaces in the category name, if any. - "bookKey" should be replaced by the book tag, if you're using a JSON file as your datasource, or the book title (minus blank spaces) if you're using Plugin Manager. This will return true if the player has already read the book, or false if he didn't. This is the first plugin I'm sharing, but I don't intend it to be the last. So, I've built a little demo showing how this one works, and will update it in the future with new releases. You can download the demo project here. Also, I probably would have taken ages longer to find my way through the default code without studing a few of Yanfly's plugins. So... really... thank you for your hard work, and keep flooding ourselves with amazing free plugins. A lot of things I dreamed of building back at the XP ages are now available thanks to you. 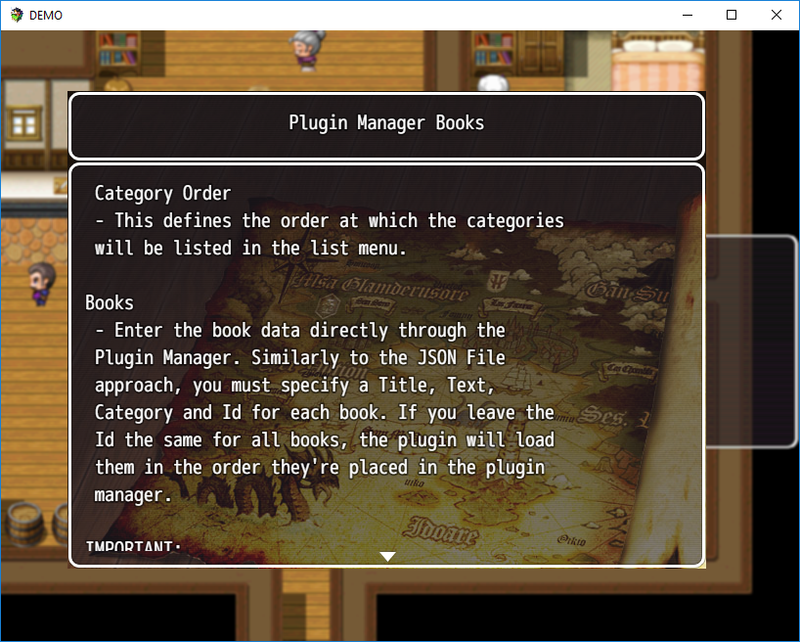 If using the Plugin Manager as source and a book text is left with an empty the game can break if you try to access the book. As I see no use on loading a book without any text, I'm not planning on failsafe that for now. Reworked the Window_BookText prototype to allow inline images to be included along with a book text. Included a new feature allowing books to have custom background images that override the default ones. It comes with options to use the custom images on the detached scene only, menu scene only, or both. The image can also be set to cover only the text window or title + text windows. Included the possibility to customize scene backgrounds with images. 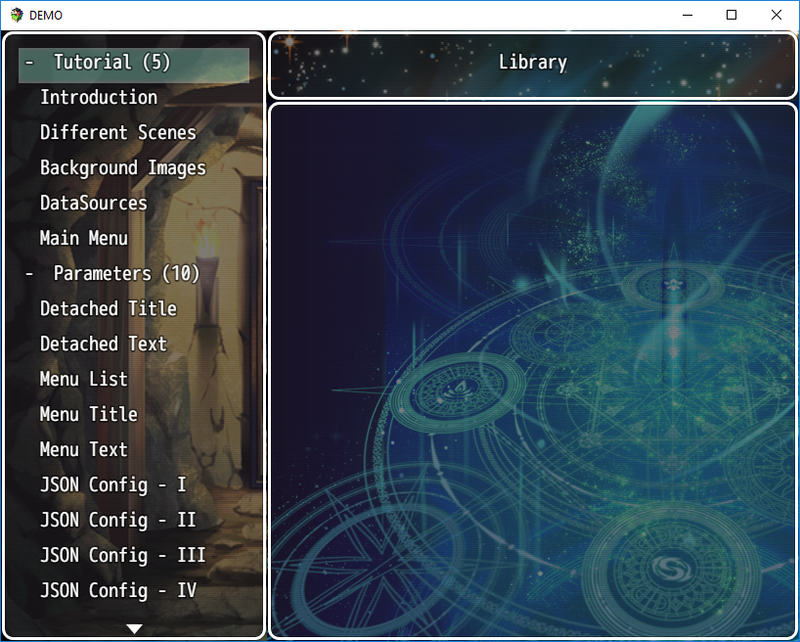 The Detached Scene and Menu Scene have different configurations, so that they can have different backgrounds if the dev wishes. SwiftIllusion, Parallax Panda, megumi014 and 9 others like this. that is a really nice plugin. I like that you can use categories and that a nice folder like structure is displayed when reading the books. Only one minor thing came to mind when I tested your demo. I used the mouse to navigate the menu. Sadly I couldn't scroll through the category list and couldn't scroll through the book. (I really like the soft scroll when using arrow keys tho and the fast scroll when using page down key. Otherwise a really nice plugin. Thanks for sharing. Thank you for sharing this plugin! So useful! I do wonder, is there a possiblity to add custom pictures/backgrounds in the pages? This is a nice plugin! I can see various ways this can be used, from lore books to recipe books. Book plugins are pretty important for story games, thank you very much for making this! To be honest, I didn't really do much testing with mouse scrolling. I'll take a look and see if I can manage an update soon. Edit: Updated to version 1.0.1 just now including the fix for the mouse wheel issue! I didn't originally planned something like that, but it is a nice feature and yes, it can be done. I'll probably release a minor version fixing mouse scrolling first, then I'll see into this. I'll let you know when it's ready! Roguedeus, Felski, Kyuukon and 1 other person like this. I've updated the plugin including parameters to configure background images for both scenes separately, so that you can set up different backgrounds in each case if you wish. The demo has also been updated to show this. There’re a couple new images to exemplify what I'm saying in the main post and in the spoiler tag below. @Kyuukon ... Please let me know if this was what you had in mind. @Felski , not sure if you saw the edit to my last message, but the mouse wheel issue is also fixed! Roguedeus, dragoonwys and Kyuukon like this. I've been playing around with this plugin for the past week, being able to do everything in the editor is a treat since it makes my life easier. After writing a few lore locations, I wonder if its possible to include a small picture with each book. Example a book for Legendary Wanted Criminal, the book comes with a picture of a Wanted poster somewhere on screen or behind the text? I think it might give the lore some more flavor context. Actually, I plan on implementing a feature like what you described. 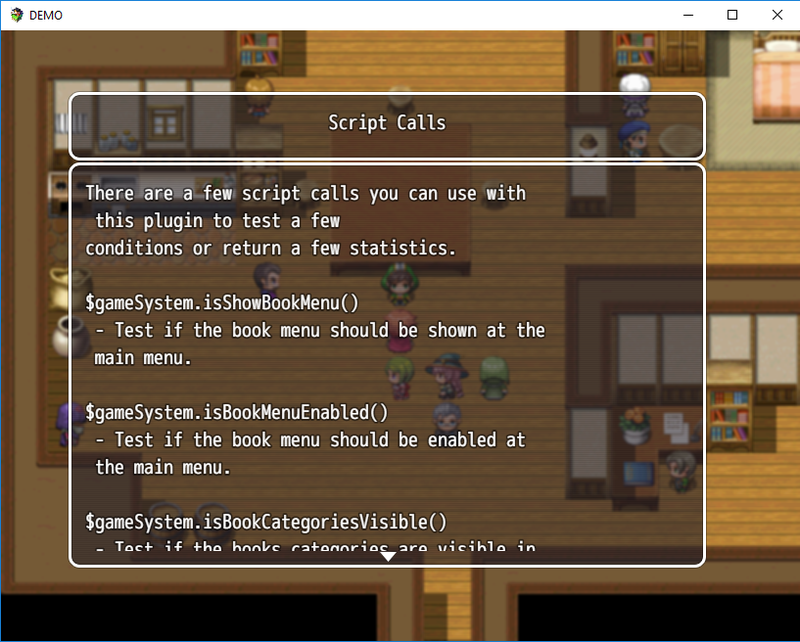 One way I use this plugin in my own project is to have "tutorial" book entries which the player can use to check on specific gameplay features, query a list of the game's state effects, etc. I plan on implementing a way of including images to make it more visual, same as your example. It may take a while though. I'll be out for a few days and I have a lot of work queued for the next few weeks in my day job. I'll let you know as soon as a new version is out! Finnuval and dragoonwys like this. Don't stress yourself and take as much time as you need, its for fun after all. I'm very grateful that you shared this plugin in the first place! Finnuval and taaspider like this. Nice looking plugin, would definitely give this a try. Can text codes be used? @blade911 Yeap, you can use text codes or icons in the plugin editor for your books. @blade911 You can use text codes normally using the Plugin Manager as datasource. If using a JSON file, you may need to escape the backslash (so \C should be used as \\C). @dragoonwys , I've just updated the plugin to version 1.2, including options to set custom backgrounds for individual books (which override the global settings). I'm working on another version to allow inserting images along with the book text, but I'm can give a clear estimate as to when that will be released (still studying the best way to do that). I'll update this thread as soon as it is ready though. styx92, Finnuval and dragoonwys like this. Woah, that is a neat update. Definitely having custom backgrounds for individual books can add more personal touches to the things like different books having different paper background when you open them up. Good work on implementing it, looking forward to seeing more of this plugin! Ok, I just release a new version with the option to include images along with the book text. Be advised though that all the methods related to actually printing the data in the text window had to be almost completely reworked for this. I did some testing here, but since there were big changes I would recommend running your own set of tests after updating your project (and let me know if something strange happens). One last detail: as for version 1.3.0, inline images are not supported with the empty book settings (when there is no book selected in the book menu). It may not be too hard to make it happen, but unless someone really needs it I'll leave it as it is! Roguedeus and styx92 like this.